Have you ever come across a book that seems as if it had been written just for you? That’s what I felt about Kim Fay’s debut novel, The Map of Lost Memories (Ballantine, 2012). If you’ve read this blog much, you’ll know that I’m obsessed with 1930s Shanghai. Fay breaks free from this popular period and sets her novel in 1925 Shanghai! Before signs of World War II, 1925 Shanghai epitomized the roaring twenties. The story continues on to Saigon (tres romantique, n’est-ce pas?) and various parts of Cambodia. Inside, the small living room was crowded with a dozen overheated journalists and revolutionaries, as well as the usual assortment of eccentrics that congregated at parties in Shanghai in 1925: a Persian opera singer, a White Russian baroness, and a gunrunner of indeterminate nationality. There was a priest bright-eyed on cocaine he had ordered from the room service menu at the Astor House, and Irene Blum recognized the Italian fascist she had seen the night before, parading through the Del Monte with a tiger on a leather leash. Irene Blum is an American who was cheated out of a job curating a renowned Asian art museum in Seattle. 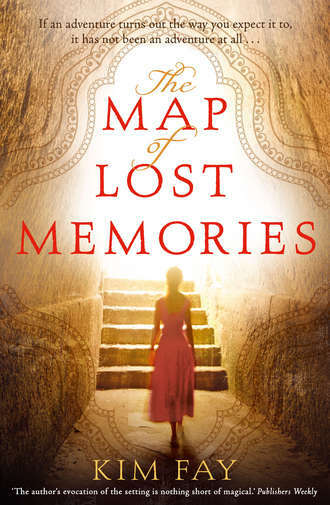 But when a benefactor of the museum provides her with a chance to discover ten copper scrolls in a lost temple in the Cambodian jungle, she leaves Seattle behind. It turns out that Irene’s parents spent years in Asia, including Cambodia and the Philippines. There they knew Mr. Simms, the benefactor. In several twists and turns, Irene becomes acquainted with a French revolutionary, a Shanghailander spy, and a Cambodian prostitute-turned-tai tai, among others. They help Irene in her quest to find the scrolls, while at the same time threatening that very mission. Kim Fay is not only an engaging storyteller, but a beautiful writer who made me feel like I was in 1925 Shanghai (minus the cocaine), Saigon, and Cambodia. The smells, the clothes, the food–she covers it all. She also makes the reader think about ethical issues of art acquisitions, especially when it comes to art from occupied countries. If you have read this book or read it in the future, I would love to hear what you think. Hmm… I think I might have to try and track this one down, sounds great!